Rediff.com » News » Anupam Kher to Aamir: When did 'Incredible India' become 'Intolerant India'? 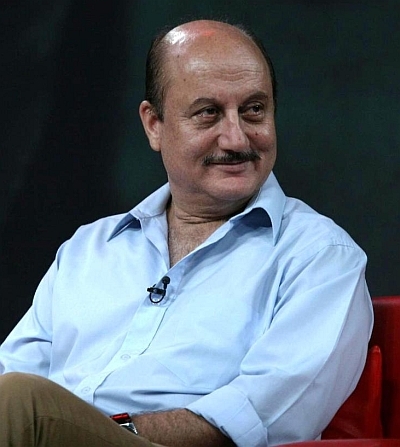 Anupam Kher to Aamir: When did 'Incredible India' become 'Intolerant India'? Bollywood actor Anupam Kher, who has not held back his words when it comes to taking on those who have been protesting on the rising intolerance in the country, has now slammed superstar Aamir Khan for his comments that he too felt that the sense of insecurity and fear had been growing in the past six or eight months. "When I sit at home and talk to Kiran, she says 'Should we move out of India?' That's a disastrous and big statement for Kiran to make. She fears for her child. She fears about what the atmosphere around us will be. She feels scared to open the newspapers every day. "That does indicate that there is this sense of growing disquiet, there is growing despondency apart from alarm. You feel why this is happening, you feel low. That sense does exist in me," 50-year-old Aamir told an audience at the Ramnath Goenka Excellence in Journalism Awards in Mumbai. Hours later, in a series of tweets addressed to Aamir, Kher expressed what he thought about Aamir's statement. He also questioned Aamir as to when had Incredible India turned Intolerant India for him. >> Dear @aamir_khan. Did you ask Kiran which country would she like to move out to? Did you tell her that this country has made you AAMIR KHAN. >> Dear @aamir_khan. Did you tell Kiran that you have lived through more worse times in this country & but you never thought of moving out. >> Dear @aamir_khan Presumed country has become #Intolerant. Wat do u suggest 2 millions of Indians? Leave India? Or wait till regime changes? >> Dear @aamir_khan. #SatyamevaJayate u talked about evil practices but gave Hope. So even in ‘Intolerant’ times u need 2 spread Hope not Fear. Also on Monday, in an interview to news channel BDTV, Kher said: "This country, the people have given me so much, I am what I am because of the country. You should not defame your land to satisfy xyz's political motives. I agree there are instances that make us feel insecure but instead of abandoning and starting the blame game, we should reflect upon the causes and learn how to fix it. India is known to be a land of love and benevolence that and I am proud of it." "We have termed the word 'nationalism' as something very old fashioned. Nobody today takes pride in saying that he or she is a true nationalist and this is a sorry state. You can't take a nation that has given you your identity, for granted." "State your point but don't drag it under the influence of other people," he added.